The bicycles are another one of BM’s trademarks, everyone brings their own. Decorated with stuffed animals, lights, baskets, coolers, and any other peculiar objects, all things that say a little about the drivers mostly not so conservative personalities. This edition tested an interesting new article: around five thousand green bikes, donated to the event by one of its sponsors, were spread all over BRC. All with the inscriptions “Yellow Bikes”. Inspired by a project of the Dutch government – where anyone can find a public bike on the street, drive it to their destination, and leave it there for some other pedestrian to drive – the Yellow Bikes filled up with joy the days of those who for any reason forgot their own. 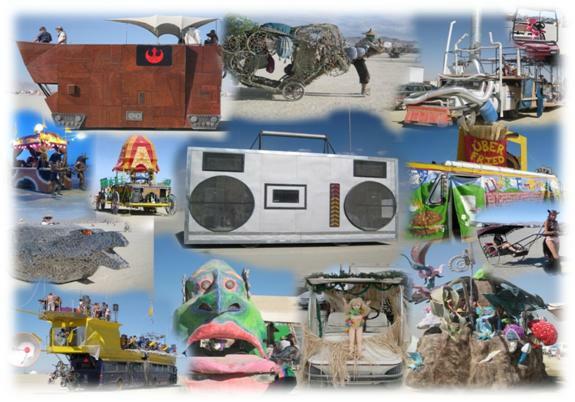 The art cars, or mutant cars, are motorized vehicles packed with cheering passengers that drive on the playa at 10km/h. They’re attractive art projects on wheels, in all imaginable shapes and sizes, some of the biggest ones can take up to 500 people at a time. In their interiors we can find nightclubs, bars and even moving snack restaurants (they remind me a lot of the Rio de Janeiro Carnaval Parade cars). Their outsides are even more intriguing: a huge birthday cake, a Maia carriage, a spaceship from the movie StarWars and even a giant stereo. Before taking a mutant car to BM don’t forget the pre-registering deadlines on the official website and to schedule your DUI hotties inspection on arrival.